Aqua Energy has three heated indoor pools which are open all year round, and also two outdoor pools which are open during the warmer months. Used for lap swimming, lessons, training, aquatic group fitness classes and casual swimming. This pool has 6 lanes, starting blocks, adjoining changerooms and sauna (including an accessible changeroom) plus a hoist and temporary steps available for accessibility. Used for gentle exercise, lessons and aquatic group fitness classes. This pool has an access ramp, and is solely dedicated for gentle exercise (physiotherapy, rehabilitation, recovery etc.) between 6.00am - 9.00am and 2.30pm - 4.00pm Monday - Friday, and 9.00am - 11.00am on weekends and public holidays. ‍Used for lessons, casual water play and casual swimming. This pool has a dedicated infant learn to swim pool with beach entry and water play features, and the ability to swim through to a larger learn to swim pool. For Pool Entry Fees please see our Fees page. 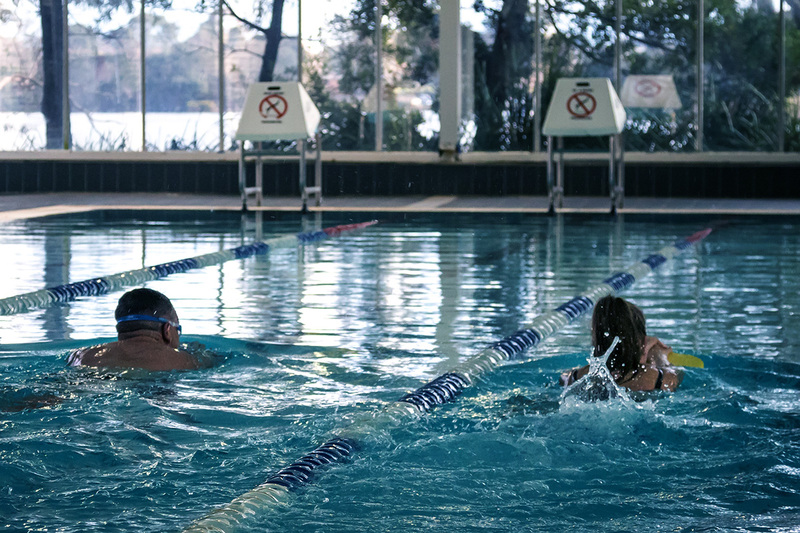 Operational during the warmer months, our outdoor pools are located in a fantastic, picturesque position neighbouring the Sale Botanic Gardens and overlooking Lake Guthridge, and include large grassy lawn areas, a shade structure, tree shade and BBQ facilities. Used for lap swimming, casual swimming and competition. This pool has 8 lanes and starting blocks. Used for casual toddler swim and water play. This pool has a step entry and shade sail. The Indoor Pools are not seasonal, they operate whenever the facility is open. The facility operating hours are displayed at the base of this page. The Outdoor Pools are currently closed (due to the cooler season), and will reopen in November. Outdoor pool operating hours may be extended by one (1) hour if the temperature is over 30oC, an hour before closing (Conditions apply). No entry permitted 15 minutes before closing time. For reasons of safety, outdoor pools will close if thunderstorms are in the vicinity. Any responsible person over 16 years of age who is accompanying a child / children (under the age of 5 years) to any Wellington Shire pool must now ensure they are always in the water with the child /children, and within arms reach at all times. Our comprehensive Swim School program provides lessons to children aged 6 months through to adulthood. Further information is available on our Swim School page. Our pools are available for hire to small or large groups. To submit your hire request please complete the Pool Hire Form. We offer AquaEasy, Aquacise and Deep Water Running aquatic group fitness classes. For more information please see our Classes page. In addition to Aqua Energy, Wellington Shire Council also operate 5 outdoor pools located in Heyfield, Maffra, Rosedale, Stratford and Yarram. For information on these pools please see the Swimming Pools page on the Wellington Shire Council website.